In an exclusive interview for Filmatique, Lorenz Suter discusses solitude, film noir, shooting a Dogme-style movie in Switzerland and his next project. "An elegant tribute to film noir… Strangers is a mysterious film dominated by a melancholic and sensual atmosphere"
"The theme of 'ambiguity as a force' is certainly emphasized by a refined dramaturgy that is reinforced by the artful/skilled editing (Bigna Tomschin). When the exact distance between two people is unclear— as is also the case of the ambiguous relationship between the two sisters— it then becomes the object of experience, it is intuited. Hesitation becomes sensuality: that seems to be an inspiring motto for Lorenz Suter, who chooses his images carefully, avoiding artificial lights, and creating a particular urban tonality that approaches a glamorous black-and-white (where Zurich is both recognizable and transcended at the same time). The soundscape focuses on depicting Tamás' interiority, stressing his separation from the outside world and from other persons, a distance that is however tentatively explored. 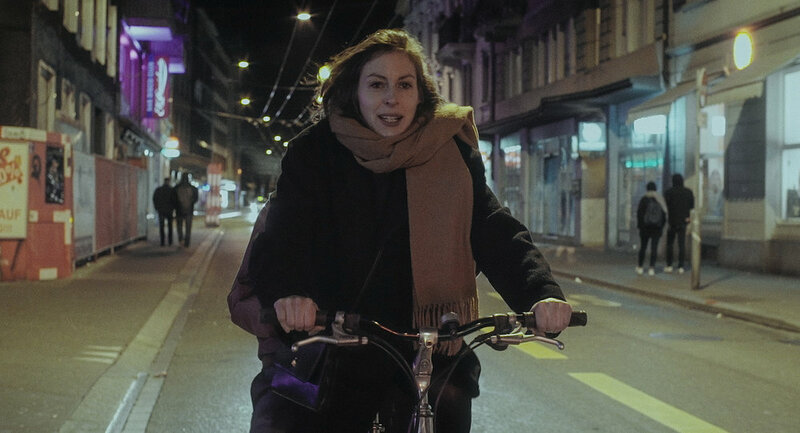 Positive ambiguity comes also from the brilliant performances of the actors, among which Jeanne Devos is particularly impressive, in her portrayal of the most ambiguous of the three main figures… Strangers becomes a phenomenological study of the crimes against loneliness and companionship, and at the same time a plea for both solitude and social interactions. On one precise condition: that we continue as wonderful strangers, each to the other"
"Strangers is defined by moods and flowing perceptions. Tamás is not a reliable narrator, especially since he soon begins to doubt himself and his own perception. And Lorenz Suter makes sure that his cinema audience does not fare any better… he has made a film full of circular conclusions, strange symmetries… a dreamlike odyssey through Zurich by day and and especially by night, with characters you think you know that then seem foreign again… like Cyril Schäublin's Dene Wos Guet Geit (Those Who Are Fine), Strangers dares to do something completely different by embracing an original, enthralling approach to the viewer's heart and mind, where dream is memory at the same time"